Statistical Concepts consists of the last 9 chapters of An Introduction to Statistical Concepts, 3rd ed. 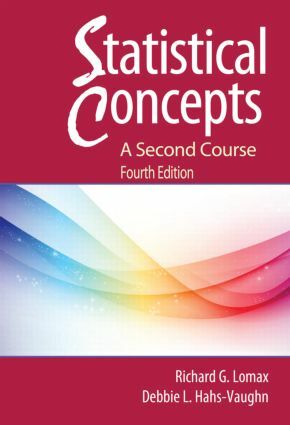 Designed for the second course in statistics, it is one of the few texts that focuses just on intermediate statistics. The book highlights how statistics work and what they mean to better prepare students to analyze their own data and interpret SPSS and research results. As such it offers more coverage of non-parametric procedures used when standard assumptions are violated since these methods are more frequently encountered when working with real data. Determining appropriate sample sizes is emphasized throughout. Only crucial equations are included. New co-author, Debbie L. Hahs-Vaughn, the 2007 recipient of the University of Central Florida's College of Education Excellence in Graduate Teaching Award. A new chapter on logistic regression models for today's more complex methodologies. Much more on computing confidence intervals and conducting power analyses using G*Power. All new SPSS version 19 screenshots to help navigate through the program and annotated output to assist in the interpretation of results. Sections on how to write-up statistical results in APA format and new templates for writing research questions. New learning tools including chapter-opening vignettes, outlines, a list of key concepts, "Stop and Think" boxes, and many more examples, tables, and figures. More tables of assumptions and the effects of their violation including how to test them in SPSS. 33% new conceptual, computational, and all new interpretative problems. A website with Power Points, answers to the even-numbered problems, detailed solutions to the odd-numbered problems, and test items for instructors, and for students the chapter outlines, key concepts, and datasets. Each chapter begins with an outline, a list of key concepts, and a research vignette related to the concepts. Realistic examples from education and the behavioral sciences illustrate those concepts. Each example examines the procedures and assumptions and provides tips for how to run SPSS and develop an APA style write-up. Tables of assumptions and the effects of their violation are included, along with how to test assumptions in SPSS. Each chapter includes computational, conceptual, and interpretive problems. Answers to the odd-numbered problems are provided. The SPSS data sets that correspond to the book’s examples and problems are available on the web. The book covers basic and advanced analysis of variance models and topics not dealt with in other texts such as robust methods, multiple comparison and non-parametric procedures, and multiple and logistic regression models. Intended for courses in intermediate statistics and/or statistics II taught in education and/or the behavioral sciences, predominantly at the master's or doctoral level. Knowledge of introductory statistics is assumed. 1. One-Factor Analysis of Variance - Fixed-Effects Model. 2. Multiple Comparison Procedures. 3. Factorial Analysis of Variance - Fixed-Effects Model. 4. Introduction to Analysis of Covariance: The One-Factor Fixed-Effects Model With a Single Covariate. 5. Random- and Mixed-Effects Analysis of Variance Models. 6. Hierarchical and Randomized Block Analysis of Variance Models. 7. Simple Linear Regression. 8. Multiple Regression. 9. Logistic Regression. Appendix Tables. Richard G. Lomax is a Professor in the School of Educational Policy and Leadership at The Ohio State University. He received his Ph.D. in Educational Research Methodology from the University of Pittsburgh. His research focuses on models of literacy acquisition, multivariate statistics, and assessment. He has twice served as a Fulbright Scholar and is a Fellow of the American Educational Research Association. Debbie L. Hahs-Vaughn is an Associate Professor in the College of Education at the University of Central Florida. She received her Ph.D. in Educational Research from the University of Alabama. Her research focuses on methodological and substantive research using complex survey data, program evaluation, and practitioner use of research to inform their practice. Dr. Hahs-Vaughn was the recipient of the 2007 College of Education Excellence in Graduate Teaching Award, 2009 College of Education Distinguished Researcher Award, 2009 Teaching Incentive Program Award, and 2009 Research Incentive Award. She is currently the Executive Editor of the Measurement, Statistics, and Research Design section of the Journal of Experimental Education.